5 Things to eat for breakfast on your wedding day! Wedding season is still in full swing, and we believe that starting the big day on the right foot is key. This one goes out to all the grooms and groomsman who have time to kill before the ceremony and are all done with the pictures, poses and ‘surprise’ gift exchanges. Now’s your chance to finally grab a bite because we all know you’re not getting any food once the wedding celebrations begin. Hop over to Boom Breakfast with your boys to put something warm and delicious in your bellies to replace those pesky butterflies. Here are some suggestions to kick off your big day. It’s your wedding day, it’s never too early to drink with your mates. Grab some Mill St. Tankhouse Ale or Organic and do a big old fashioned cheers with your boys. If you feel the need to make a speech, it’s all good. Just don’t drink yourself under the table, because we want you to make it to the altar. Couldn’t sleep last night because you were too excited huh? Totally understandable. What you need is a mug full of freshly brewed breakfast blend coffee to wake you up. And the best part is that it’s bottomless, so you can get your coffee fix for as long as you need it. It’s your big day, eat like a king. Order up an Eggs Benedict VI! We cook our 6oz. steak to medium well, throw it on an English muffin, top it with caramelized onions and 2 XL poached eggs, then finish it with hollandaise. Grabbing burgers with your boys is something that never gets old. Continue the tradition with our Brunch Burger. Made with an XL over easy egg, peameal bacon, pickles, lettuce, tomatoes and onions, this burger will make you feel like you’re on top of the world. As you should! Want something to remind you of how amazing it is that you and your significant other have found each other against all odds? 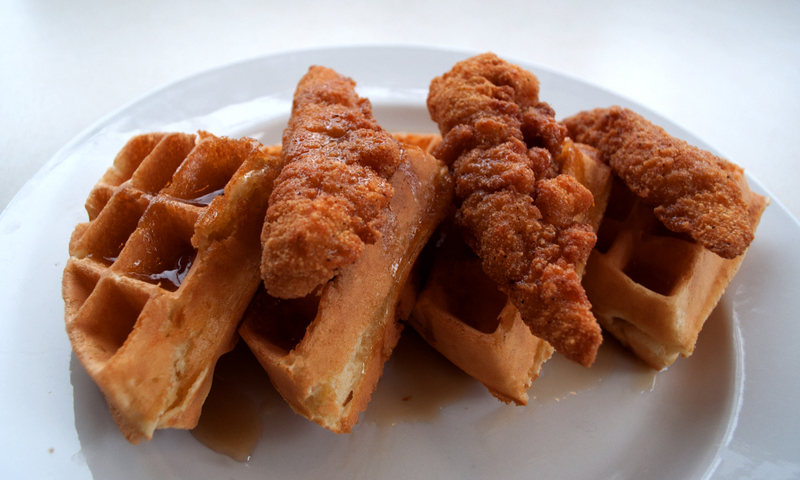 Then you must have the Chicken and Waffles. It symbolizes the coming together of two great things like crispy fried chicken tenders and fluffy Belgian waffles, bound together with maple butter. It’s a great combo, just like you and your to-be spouse. Need more? There’s a whole breakfast and brunch menu waiting right here for you. So stop by at Boom Breakfast, the best breakfast restaurant in Toronto to spending the morning with your groomsmen.